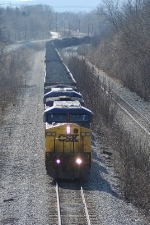 Description: CSXT 2 & 92 are seen leading coal mtys west at Cumberland, MD. Description: CSXT 2 is seen at Cumberland, MD. Description: CSX AC44CW 2 in between two other CSX locomotives in the yard at Manchester, Ga. Title: This coal train again and another super tall SAL signal! Description: The second AC4400CW to be built for CSX is Dead in tow on Q602 bound for Waycross Rice Yard. Title: CSX 1 & 2 when they were brand spanking new! Description: This was scanned from the back cover of a Fire Department training manual. A friend of mine got it thru his volunteer FD and thought I would like it. I saw this pic and had to post it here. The manual is from 2005. I dont know who the photographer is nor the location. I just thought it was neat to see how these units looked new, and the fact that they are hooked together pulling a train!! This could very well be the one and only time this lashup has ever happened!!! Description: CSX #2 leads V669-29 towards East Fostoria. Description: CSXT 2 leads # 255 eastbound after turning the corner at Fostoria, Oh., and past F Tower, as it heads east for Willard, Oh. Description: After waiting on a westbound to clear Big Bend Tunnel, These two GE's are in notch 8, and laying the sand down to get their loads back up to speed on this .3% grade. Description: The eastbound loads are in notch 8 and sanding hard as the reason they were stopped passes by with unit 329 going solo on empty gons. Description: CSXT E646-11 heads west across the trestle in Downtown Richmond behind the River Lofts.